When I was a kid, every once in a while my father would surprise me with a bar of Mackintosh’s Toffee. For those of you who’ve never had the pleasure of smacking a Mack, this distinctively Canadian treat is a bar of not too hard and not too soft toffee in a distinctive red tartan cardboard box. My job was to smack it against the kitchen counter and carefully unwrap the toffee. We’d pick out bite size pieces and sit up late talking. I was so sad when Nestlé Canada stopped making these toffee bars a few years back. For a while the only toffees we could get were individually wrapped bite-size soft candies that tasted nothing like the classic bar. So when they brought back Mackintosh’s Toffee a couple of years ago, I was pretty stoked. The toffee recipe tastes slightly different, but pretty close to what I remember. 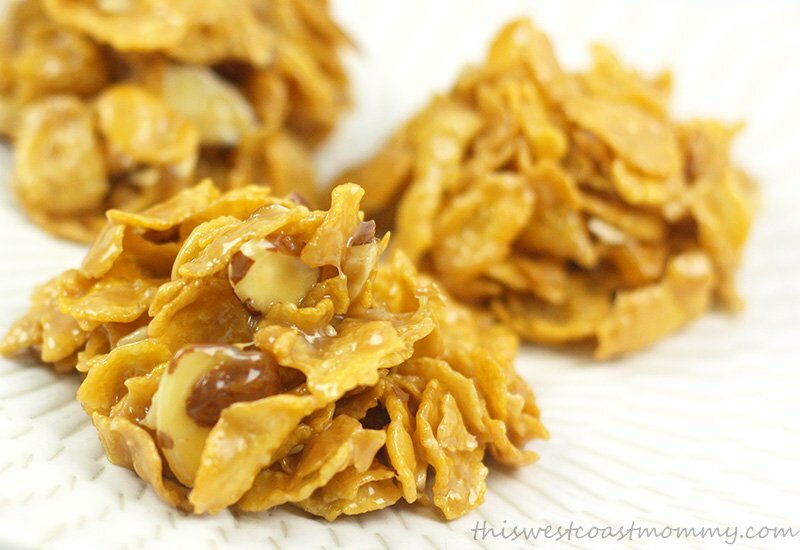 And perfect for making one of my favourite treats again: no bake corn flake toffee cookies! Now, I usually post paleo and clean eating recipes, so let me be clear. There is no theory under which these are remotely good for you. What they are though, is incredibly delicious! We all need a treat once in a while, and these are one of my favourites. 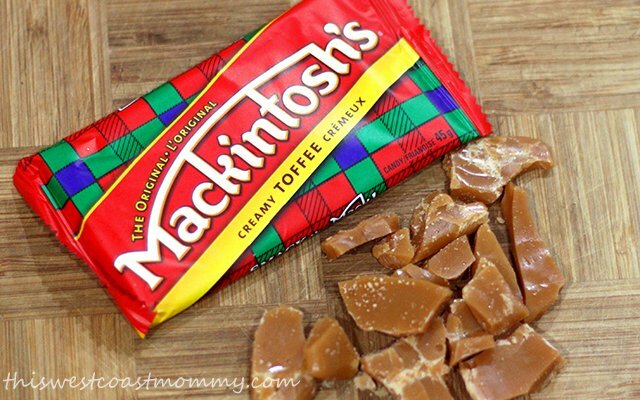 Mackintosh’s Toffee is a unique Canadian treat, but never fear American friends. These are sold on Amazon in packs of 4 or 12. Once you smack a Mack, you’ll never go back! If you have celiac disease or are avoiding gluten for whatever reason, be sure to choose corn flakes that are certified gluten-free. Most commercial corn flakes contain barley malt which contains gluten, but there are several brands of gluten-free corn flakes on the market now. They’re super simple to make. If you can make rice cereal treats, you can make these. Melt some butter, toffee, and coconut milk, then add corn flakes, sliced almonds, and a touch of vanilla. See? Easy peasy! I like the look of “cookies”, but these are easily made in dessert bar form too. 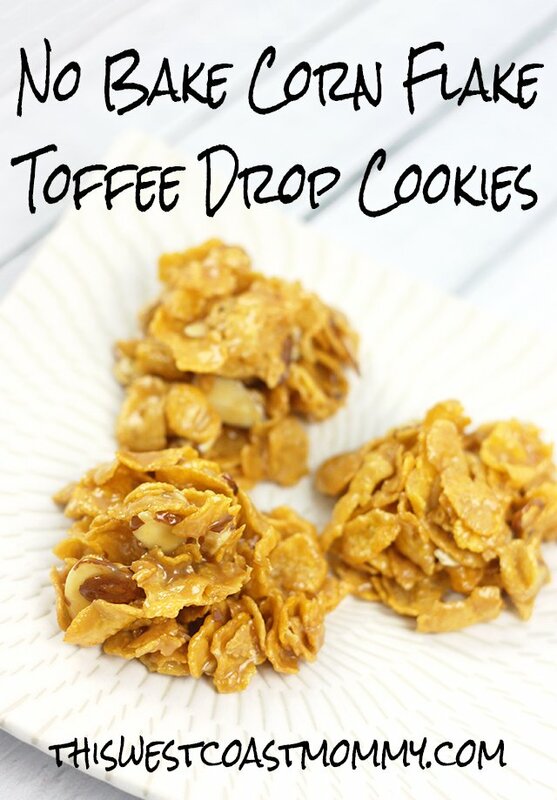 Just press the corn flake toffee mixture into a lightly greased baking dish and chill. In fact, the drop cookies sometimes need a little bit of help taking shape before they set, so they stay together a little more as a pressed cereal bar. Either way, they taste just as good as I remember! Start by smacking your Mack into small pieces. Add toffee pieces and coconut milk and stir frequently until the toffee is completely melted. Watch the pot carefully to make sure it doesn't burn. Once fully melted, add vanilla extract and stir. Add corn flakes and sliced almonds, mix until well-covered. Drop onto wax paper and allow to cool. For corn flake toffee bars, make recipe as instructed above and press mixture into a lightly greased medium baking dish. Chill and cut into squares once hardened. 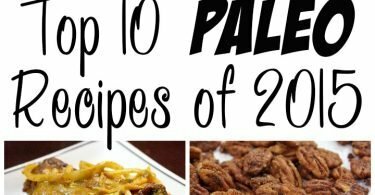 Yay I had seen this post somewhere on another linky but lost track – found you again at This Zis How We Roll 🙂 Pinned – I have a giant box of cornflakes that I had bought to use for crunchy potatoes but only needed one cup! I have to find some gluten-free corn flakes to try this! Looks awesome. You should come link up at our Bloggers Spotlight party tonight, we pin everything to our group board and have two separate link-ups, one for posts and one devoted to pins so you get even more exposure! These look so delicious but I do not have access to this toffee! Would love to try them using something similar though! You could try it with another brand of toffee. This toffee is my fave because it’s not too hard or soft. 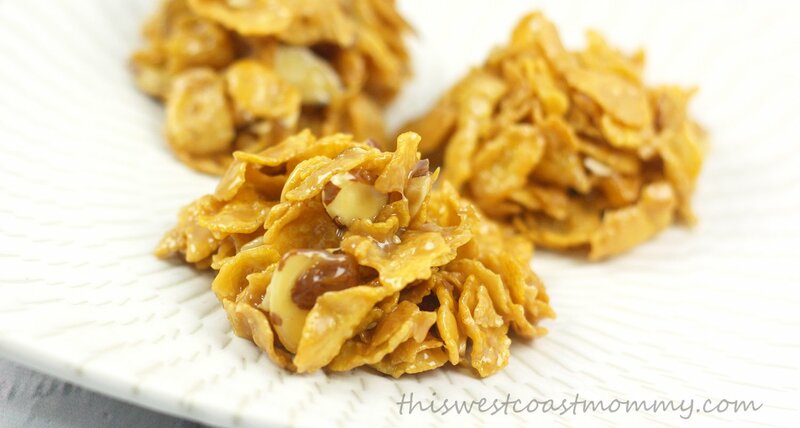 You do need to use chewy toffee (the hard, brittle stuff won’t melt), but the stiffer you can find the better so it solidifies with the corn flakes. You might need to reduce the coconut milk or even leave it out entirely if you can only get soft toffees. These look so yummy, I love toffee!! 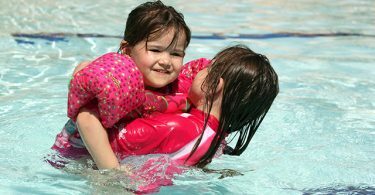 I cant wait to try amking them with my daughter!! OMG, can this be true? I am in love with this recipe but I will try to limit myself to only making it once a month! These look decadent, I can hardly wait to try this recipe!! These look totally amazing! I am going to try to make some for the Vernal Equinox. Thanks for sharing! MacKintosh toffee IS my childhood. I have to try these! Very different and they look good . I would love to try this recipe too see what they taste like. What size bar did you use? I know I’d love this! Mackintosh Toffee was my favourite special treat when I was a kid, I used to get so excited when I’d see that red package! I have been looking for a new cookie recipe and this one looks like a great one to try. I’m willing to bet my family would love these! Can’t wait to try them out!